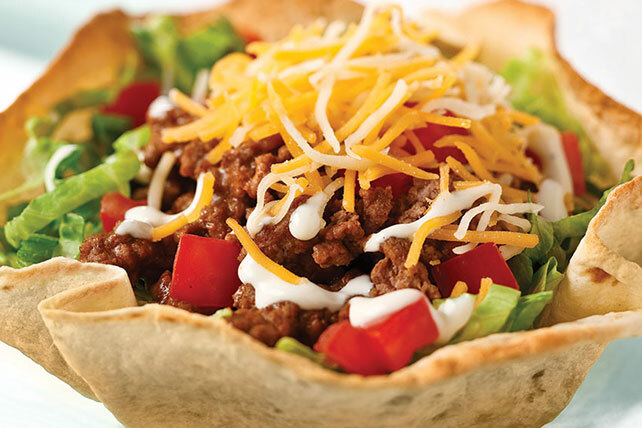 Begin the night with an easy taco salad recipe. A time-crunched night calls for a cheesy, meaty Weeknight Taco Salad Recipe in an easy-to-make edible bowl! TACO BELL® and Logo are trademarks owned and licensed by Taco Bell Corp. Meanwhile, cook meat with taco seasoning mix as directed on package. Fill shells with lettuce, meat mixture, cheese and tomatoes just before serving. Drizzle with dressing. Save 80 calories and 8g of fat, including 4g of saturated fat, per serving by preparing with lean ground beef, KRAFT Mexican Style 2% Milk Finely Shredded Four Cheese and KRAFT Lite Ranch Dressing. Substitute ground turkey for the ground beef.